On this page, store admins can monitor the purchases and usage of gift cards on their site. They can also create new gift cards and edit/disable existing ones. Find currently existing gift cards with the search tool on the left. The first box can be used to search by serial number, customer name, or customer email. The dropdowns below will filter results by status and gift card type. See here for more information on the different gift card types. Clicking the 'Usage' link for a gift card takes you to the screen depicted below. Any purchases the customer has made with the gift card will be shown, and store admins can also add/remove funds with the 'Add Usage' fields and button. If set up as a product on the front end, customers can purchase gift cards, which will be automatically generated and listed on this page. 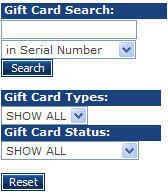 Store admins can also manually create new gift cards if desired, with the 'Add New' button. NOTE: Google Checkout does not allow purchasing stored-value cards (Gift Cards/Certificates) per their Content Policy, so you will want to select NO for the *Google Checkout Allowed: option on your Gift Card/Certificate product's Main tab. Serial Number The serial number the customer must enter during checkout to use this gift card. The software will automatically generate one for each new gift card, but it can be changed during creation here, or edited later. Expiration Date The last date the gift card is valid. Purchased by Customer ID This is the customer ID the card is being created for or purchased by. Initial Amount The starting balance on the gift card. Gift Card Type Set the type of gift card here, which determines how the customer gets the card and serial number. See below for details. Email Subject If this is an email gift card, this is the subject line for the email that will be sent. Email To If this is an email gift card, this is the recipient's email address. Email Body If this is an email gift card, this is the text of the message that will be sent to the recipient listed above. Certificate gift cards are printed out by store admins (usually on some kind of card stock or normal paper) and mailed to the purchaser. This allows them to contain any text and be any design that the store owner wants. Store admins generate and assign serial numbers to these types of gift cards manually. Physical gift cards work like certificate cards in that store admins generate the serial numbers and assign them to the card through this page, and the gift card is mailed to the purchaser. These types are generally used for plastic gift cards like the ones commonly seen in stores, though how the card is physically created does not actually matter. Email gift certificates are the only type that is sent to the recipient automatically (once payment is collected). 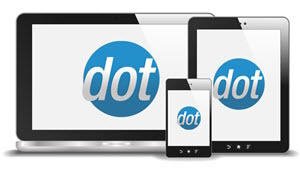 The email is generated by notification.emailgiftcard.xml.config, which can be customized. By default, customers receive a simple text notification of the receipt with a link to the store and the gift card serial number (which is automatically generated).